The ongoing advance of globalisation has created a genuine need for international tax reforms. This column explores potential reforms and their likely effects, using a model with flexible prices. Residence-based income taxation is shown to have welfare advantages over source-based taxation, though at the cost of a larger trade deficit. Non-transitory border taxes are shown to be ineffective at reducing this deficit. The growing and continuous spread of globalisation inevitably triggers a process of international tax reforms. One important aspect in this context is border tax adjustments. The latter have received even wider attention in view of recent proposals for tax reforms in the US. Typically, tax reforms have both efficiency and distribution implications. Nevertheless, the latter are not in the forefront of the issues we consider here. As is common in the literature, we simplify by considering a representative consumer. In this column, we analyse the implications of border tax adjustments in the income tax and of a shift from source-based to residence-based international income taxation, paying special attention to individual welfare and to the trade balance. In addition, we re-examine the effectiveness of border taxes as a means to reducing trade deficits. Border tax adjustments of income tax have received increasing public and scholarly attention since the introduction of the US House Republican tax plan in June 2016. In addition to replacing the ordinary corporate income tax with a cash-flow tax, it also proposed to introduce border tax adjustments (à la VAT) according to which expenditures on imports are not deductible from taxable income, and export revenues are exempted.2 We focus on the border tax adjustments components of the plan and analyse their implications for the real exchange rate. Consider a minimal Fisherian model that can serve to highlight our arguments and conclusions. Suppose there are only two periods and one composite, tradable good that can serve for present consumption (c0), future consumption (c1), investment (I), imports (M), and exports (X). There is a representative consumer and a representative producer. There is an initial endowment in the first period and none in the second. There is a flat income tax rate (t) that applies to both individuals and businesses. As is common in advanced economies, the tax is based on the residence principle, according to which residents (both individuals and businesses) are taxed on their worldwide income, irrespective of its origin – domestic or foreign.3 As residents are taxed on their capital income at the same rate whether they invest at home or abroad, the domestic real interest rate in our small open economy is equal, by arbitrage, to the internationally given real interest rate (r*). Suppose first that there are no border tax adjustments. As expected in this standard model, the equilibrium is characterised by the standard marginality conditions—the marginal product of capital equals r* and the intertemporal marginal rate of substitution of future for present consumption equals 1 + (1 – t) r*.4 Note that the marginal rate of substitution (the absolute slope of the consumer’s indifference curve) is lower than the absolute slope of the production possibilities frontier (in essence, we can say that there is inadequate domestic savings). This equilibrium is illustrated in Figure 1. Now, consider border tax adjustments, where imports are not deductible, and exports are tax exempt. Suppose that the world price of the composite good is unity. Because imports are not deductible, the domestic price of the composite good must be grossed up to 1/1-t if imported, through arbitrage. Similarly, because exports are exempted, the domestic price of the composite good will also be grossed up to 1/1-t, if exported. Thus, the consumer intertemporal relative price remains 1+(1-t)r* and the producer intertemporal relative price remains 1+r*. Hence, the equilibrium is characterised again by the same marginality conditions as before. This equilibrium is depicted in Figure 2, which also re-depict the former equilibrium for comparison. Israel’s tax system was by and large based on the source principle. That is, only income from domestic sources are subject to a tax, whereas foreign-source income is exempt. With the growing process of globalisation, especially in the capital field, Israel shifted to the residence principle in 2003.6 Here we illustrate the equilibrium under the source principle and compare it to the residence equilibrium. As foreign-source income is not taxed, whereas domestic-source income is taxed, it follows by arbitrage that the domestic real rate of interest will be grossed up to r*/1-t. As a result, the source equilibrium will be characterised by the marginal product of capital being equal to r*/(1 – t) and the intertemporal marginal rate of substitution of future for present consumption being equal to 1 + r*. That is, production is at a point, where the marginal product of capita is below the world real rate of interest (there is inadequate domestic investment). 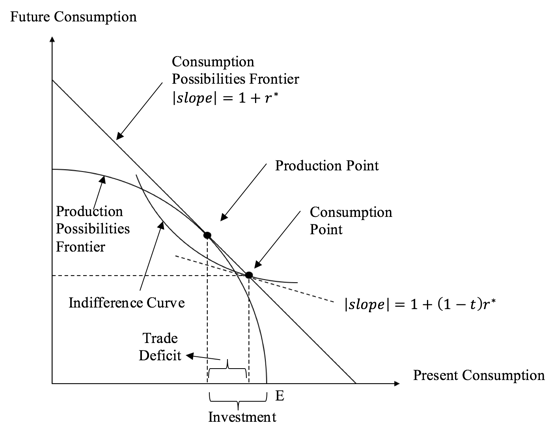 As a result, the consumption possibilities frontier shrinks (see Figure 2). Moving from a source-based to a residence-based taxation clearly enhances welfare.7 It also worsens the trade deficit (in our example in Figure 2, a trade surplus turns into a trade deficit). So far, we did not have any border taxes (barriers to trade). Even the border tax adjustments discussed in section 1 were shown not to amount to border taxes. In this section, we address the issue of border taxes. For Trump, NAFTA is “an economic disaster”, because the US has increased its trade deficit with Mexico from a $1.6 billion surplus in 1993 (the year prior to NAFTA’s implementation) to $63.2 billion in 2016. In part, the US-Mexico trade balance reflected a weak peso after it was weakened by the uncertainty over the future of US-Mexico bilateral trade relations. To reverse it, Trump’s solution is to abolish NAFTA. Policymakers often justify export subsidies and import tariffs by their effects at improving the trade balance. On the other hand, in standard international trade theory, we teach the Lerner’s (1936) Symmetry Theorem, according to which export taxes (rather than subsidies) and import tariffs have identical effects on resource allocation. In his analysis, Lerner explicitly abstracted from intertemporal aspects. The apparent puzzle is resolved once a distinction is made between temporary and permanent trade taxes in an explicitly intertemporal model. Razin and Svensson (1983) show that only a temporary import tariff improves the trade balance, and only a temporary export tax deteriorates it. However, fully persistent import tariffs or export taxes have an identical effect on the trade balance, as in Lerner’s Symmetry. Furthermore, to the first approximation, border taxes neither improve nor deteriorate the trade balance. 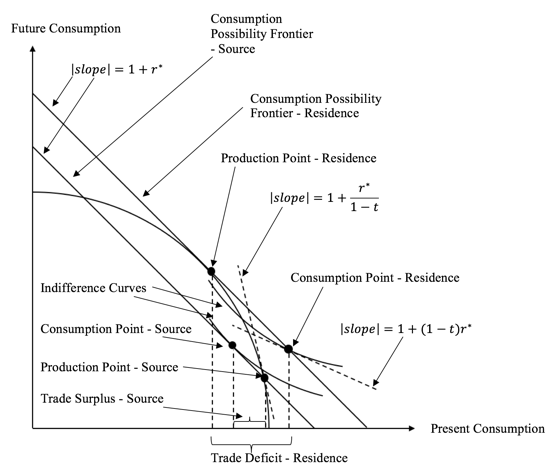 The reason for this result is that temporary trade taxes, in contrast to permanent trade taxes, result in changes in intertemporal relative prices, and hence induce substitution between present and future goods. Thus they do affect savings and investment behaviour. In looking at the residence treatment of companies (as opposed to individuals), there are two key issues. The first is that a US company may have shareholders who are not US resident individuals. The second is that residence is engodenous under US residence-based corporate tax, leading to corporate inversions. Auerbach, A J (2017), “Demystifying the destination-based cash-flow tax”, NBER, working paper 23881. Auerbach, A J, M P Devereux, M Keen and J Vella (2017), "Destination-based cash flow taxation", Oxford University Centre for Business Taxation, WP 17/01. Berglas, E (1974), “Devaluation, monetary policy and border tax adjustment”, Canadian Journal of Economics 7(1): 1-11. Buiter, W H (2017), “Exchange rate implications of border-tax adjustment neutrality”, VoxEU.org, 22 March. Diamond, P A and J A Mirrlees (1971), “Optimal taxation and public production”, American Economic Review March and June: 8-17 and 261-178. Frenkel, J A, A Razin and E Sadka (1990), “Basic concepts of international taxation”, NBER, Working paper 3540. Frenkel, J A, A Razin and E Sadka (1991), International Taxation in an Integrated World, MIT Press. Lerner, A (1936), “The symmetry between import and export taxes”, Economica 3: 306-313; also reprinted in R E Caves and H G Johnson (eds) (1968), Readings in International Economics, Allen and Unwin, London: 197-203. Razin, A and L E O Svensson (1983), “Trade taxes and the current account”, Economic Letters 13: 55–57. Razin, A (2018), Israel and the World Economy: The power of Globalization, MIT Press. Early on, Berglas (1974) and recently Buiter (2017) analyse border tax adjustments in the context of sticky prices. See a detailed analysis of the plan in Auerbach (2017) and Auerbach et al. (2017). See Frenkel et al. (1990, 1991) for an analysis of the basic principles of international taxation. This specification assumes for simplicity that capital does not depreciate. The neutrality of border tax adjustment holds also under source-based taxation, and when there are non-traded goods. Israel’s globalisation process culminated in 2010 with the joining of the OECD group, see Razin (2018). The reader familiar with the public economics literature will undoubtedly realize that this result is a variant of the Diamond-Mirrlees aggregate production efficiency theorem (1971); see also Frenkel, Razin and Sadka (1991).